Workers are racing against the clock to get everything ready for the opening of The State Fair of Texas on Friday. Nearly all of the six dozen or so rides are ready to go, as five independent inspectors at the State Fair check each and every piece. 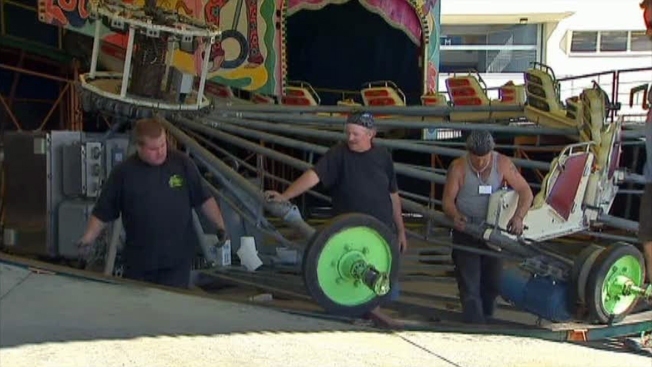 "That's one good thing about a mobile amusement ride, too, is that when they move around they get taken apart and put back together whenever they move and you can actually see a lot of these pieces," said Rusty Fitzgerald, vice president of operations with the State Fair of Texas, and the man responsible for insuring all the rides are safe. "My philosophy is, if I can't sleep at night it doesn't play here," said Fitzgerald. "I want to feel comfortable with every piece of equipment that's out here and if it doesn't cut the mustard then it's not going to be here." One ride that won't be coming back is the Stratosphere, which left two dozen riders stranded in the air for hours when it malfunctioned just days before the fair ended last year. "That would be something I'd have to worry about, so it won't be here," said Fitzgerald. Fitzgerald's inspectors check each and every piece of each and every ride, and even use a special tool to check for hidden cracks at critical points. "Basically it's an MRI for a ride,", said Fitzgerald. "We'll look at the welds and critical points to make sure they don't have cracks in them that are invisible to the naked eye." Fitzgerald is confident he'll be sleeping well during this year's fair. "Everything that's here right now, I'll be comfortable with," said Fitzgerald.